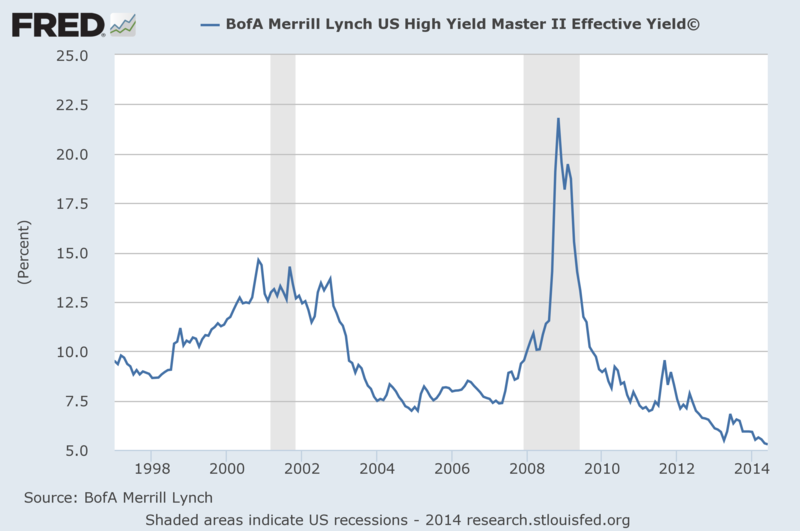 The yield for HYG, a high-yield (i.e. junk) corporate bond ETF, is currently 5.72% versus 3.56% for LQD, an investment-grade corporate bond ETF. Of course, higher yield generally means higher risk. But don't these yields already take into account defaults? In other words, say the average yield of the bonds HYG holds is 8%, but 25% default (effectively giving a yield of 0%), for an overall yield of 6%. If that is indeed the case, what is the risk of investing in high-yield versus investment-grade bonds? Is the worry that in a recession, such a high number of companies will default that the overall yield of HYG will drop below that of LQD? I looked at the yields during the 2007–8 financial crisis and didn't see evidence for this. I also figured maybe the price of HYG was more prone to fluctuation than LQD, but that doesn't seem to be the case either. Yes, current yields and current annual default rates go hand in hand. In terms of risk, high yield is like insurance: it's great when you receive the premiums/dividends, but when the chickens come home to roost, reality is unforgiving. 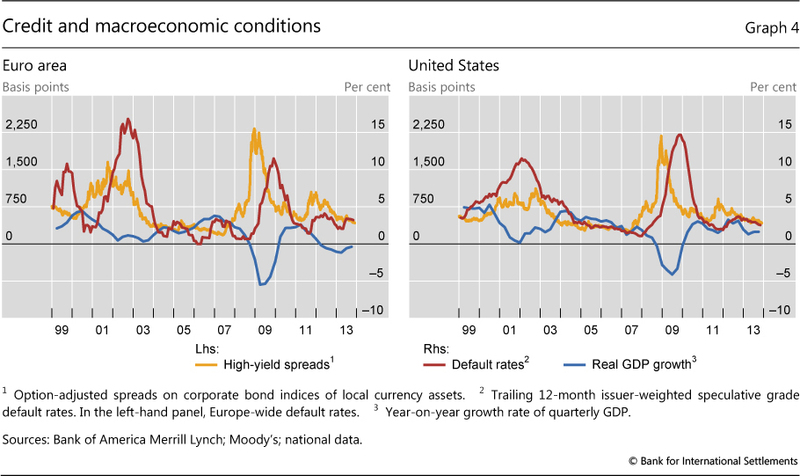 During the Great Recession, the worst credit crisis since the Great Depression, high-grade corporates lost less than 50% during a short time while high yield corporates lost approximately two thirds for an extended period. During a more typical recession, the Tech Crash, investment grade corporates lost relative little while junk again lost almost half. For these levels of risk, it's best to take on perfectly diversified corporate equity; however, the periodic negative beta is useful. As for spreads, the higher, the worse. If an asset is yielding more, indicated by a higher or rising spread, the price is dropping. Price is inversely related to rates. If the rates on junk went negative, it would be an indication that either the ratings system is broken or dogs & cats are living together, mass hysteria. The main danger of a junk bond fund is that there will be a higher rate of bankruptcy/default than in an investment grade bond fund. As a graduate student at Wharton, Michael Milliken the (future!) "junk bond king" wrote a thesis that two percentage points were enough compensation for the likely higher default rate of a junk bond fund over a corporate bond fund. Not the answer you're looking for? Browse other questions tagged bonds yield bond-funds high-yield junk-bonds or ask your own question. Stocks vs. High-yield Bonds: Risk-Reward, Taxes? 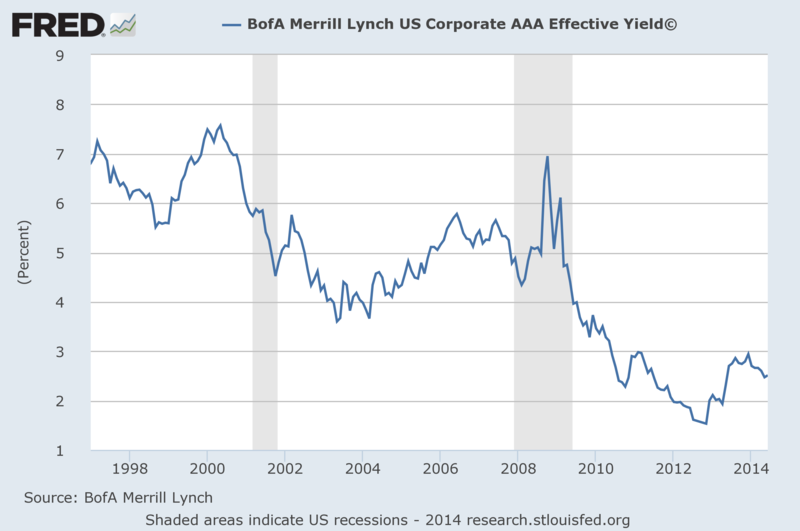 Are High Yield Bonds issued at a premium or discount?